Swishing the night away | More blue fabric? 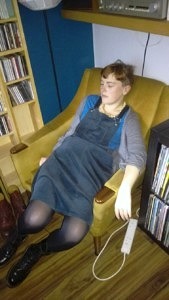 I used the By Hand London Kim dress, which I’ve now made a range of alterations to. 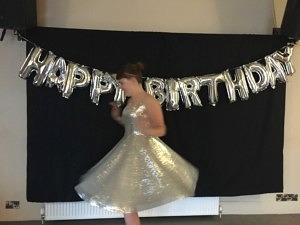 I used a self-drafted 3/4 circle skirt for added swooshiness. At one point, I genuinely lay down on top of all the sequins, I couldn’t get enough of their sparkle. On a more practical level, I’m really pleased with how the zip went in for this one; I used a standard zip as I had NO interest in trying to fit an invisible zip into sequins, and it’s come out with a very neat finish, which was pretty awesome. 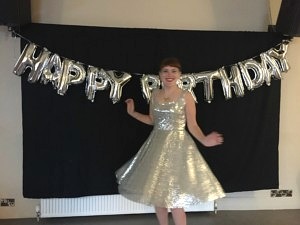 Plus, y’know, having a wonderful party dress was probably the best bit of all, particularly as the party was also pretty darned fantastic! Yes, the good was the bad; every time I cut a piece of fabric I needed to sweep up the millions of dead baby sequins. When I sewed anything I had to be super careful as to make sure that the right side of the sequins was never face down on the teeth to avoid snagging. And the constant fear of shattering a needle and it landing in my eye? Not so great. 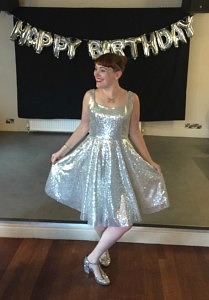 I’m not sure I’d make an entirely sequinned version of this dress again, but I’d probably make another Kim. 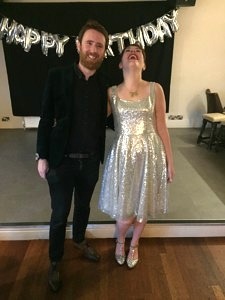 I’ve got a couple in my wardrobe now (including one which is yet to be blogged but, let’s be honest, we all wanted to see the sequins first!) and I finally feel like I’ve cracked the alterations on this. I quite fancy trying it with more of an a-line skirt (maybe something like the Hollyburn?) to see what impact it has on the feel of the dress. Ultimately, only time will tell! Absolutely bloody gorgeous! Do not envy you all those sequins though, my machine fell out with me big time last time I tried those!